"This grilled tuna recipe is a summer favorite. It cooks up quickly and is very easy to make!" Preheat grill for medium heat. Lightly oil grate. Mix together the avocado, mango, lime juice, ground ginger, and wasabi powder in a bowl. Season to taste with salt and pepper. Set aside until ready to serve. Spread the sesame seeds over the bottom of a shallow dish. 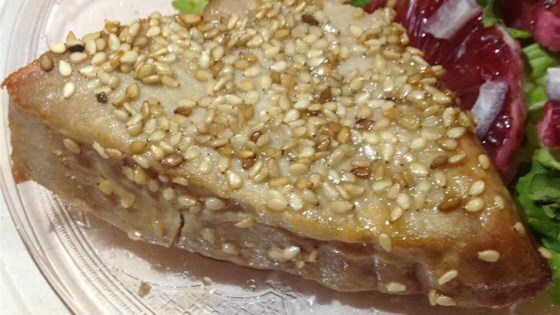 Brush the tuna steaks with the canola oil, and dip into the sesame seeds, evenly coating both sides. Place tuna steaks on prepared grill. Cook until fish turns opaque, turning once, about 4 minutes for 1 inch thick steaks. Serve immediately with summer salsa and additional wasabi on the side. See how to make grilled tuna with a fresh-tasting, sweet-and-tangy salsa. SO good! I didn't use the wasabi powder but I did put lime zest in the salsa and it was fab! Will do it again for sure! WOW! Fast & delicious! Loved it, can't wait to do this one again.